It happened with much excitement, but birthday weekend is past us now. Max had a great time with family visiting over the weekend. We all did. But, on their last day visiting, Max caught a bug and got sick. This time the bug wanted to give him fevers. Fevers that make doctors nervous and insist on him coming in to be seen. 104 degrees isn't exactly where a kid with a metabolic disease should be hanging out. Being a Sunday, we had to go to the ED, and be seen there. 104 degrees + Max's medical chart bought him a fast pass to admission. I was completely bummed that he would be waking up on his birthday at Children's. 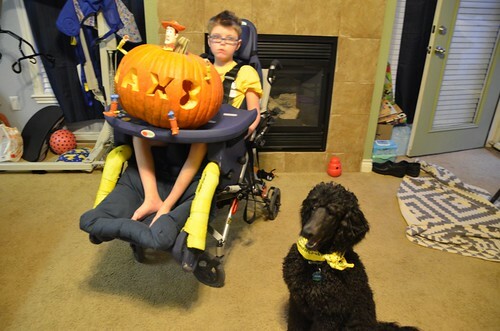 I had planned a fun birthday party for him, and he was going to get to go trick-or-treating with Abbey. The night at the hospital was fine, no big excitement. He was really just being watched. 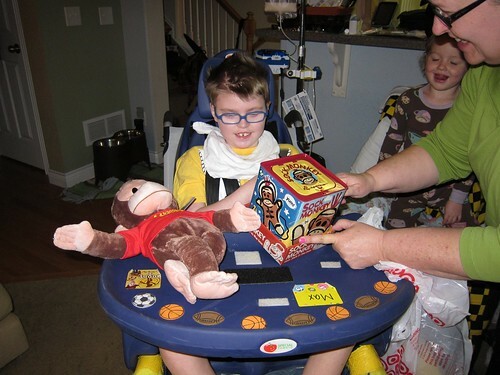 In the morning, when the doctors rounded and found nothing more than a boy with a cold, we were out of there in record time. I think it was the shortest discharge ever! We got home and rested a lot. I was starting to feel the same cold come on, and Max was exhausted. It really wasn't much different from the day he was born. A lot of sleeping going on! 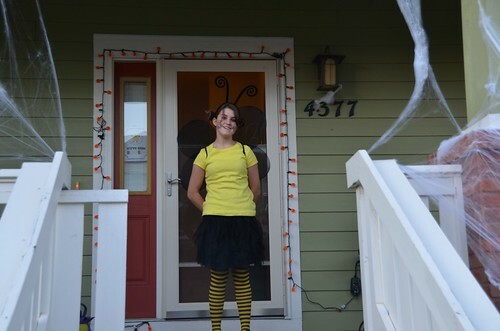 By the time Abbey got home from school, it was time to switch gears and give her a fun Halloween. It's her favorite holiday, and I didn't want to be laid up in bed while she was enjoying it. 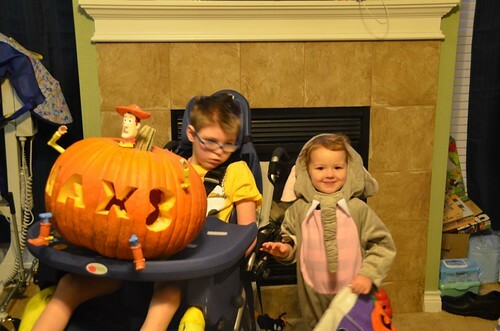 We got the pumpkins out, and candy in the bowls. Max was feeling better, so I called my sister and family to come over too. While it was much less of a party than I had planned, it was a great evening filled with trick or treaters, and celebrating our little Monster. 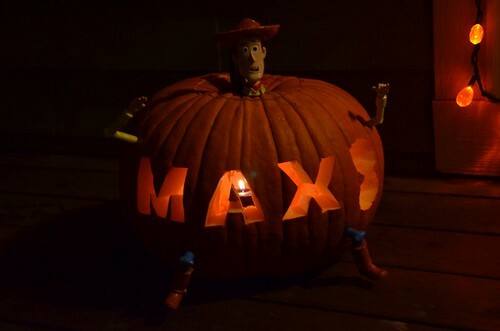 Steve did a great job of carving Max's pumpkin. And George did a great job of posing in the picture. He was waiting for a treat! 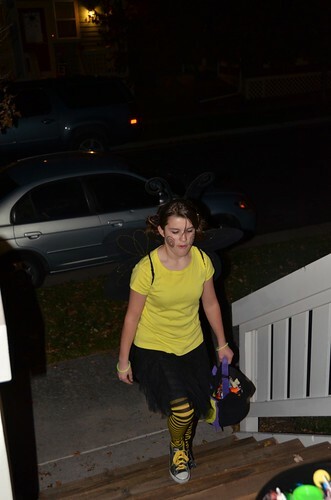 Abbey was a bumblebee. 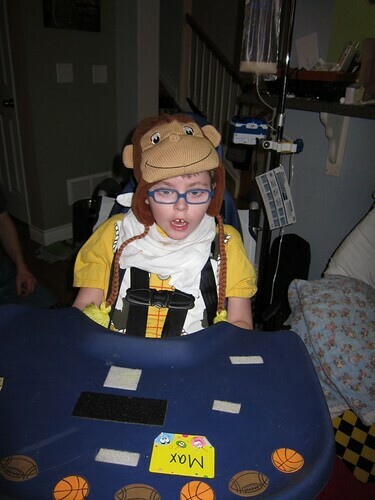 She put her costume together, and went trick or treating with some of the neighborhood kids her age. She got loads of candy! 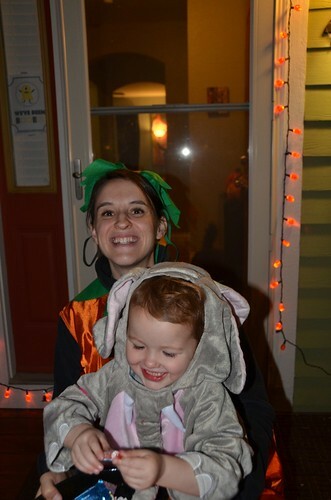 Ang and Addie helped hand out candy. Addie was insistent on giving handfuls to each trick or treater! That was loads of fun! We had dinner, the traditional chili, and ended the evening with pie and singing Happy Birthday to our big 8 year old boy. My dad called just before we started singing, so he and my brother got to join in too. Finally, it was time for a few presents, with the help of Addie, of course! Max's new winter hat from us. It wasn't the birthday I had planned for him, but it was full of memories for us all, and that's a great way to spend a birthday! What a BIG pumpkin. Glad it turned into a good day for everyone.